Welcome back to another blog post by yours truly. It’s been a while since my last blog post, and since then I have been able to get a few games in with arguably the game’s best format: Legacy. For those unfamiliar Legacy is a format that uses some of the games oldest cards, but contrary to popular belief it has not been around that long. Back in the early years of Magic you played only with the cards you owned. It took a few years until formats were developed, in which the first two were Vintage and Standard. Over the years as more expansions came out, updates to the banned & restricted list occurred, and new strategies developed some started to play a version of Vintage in where it’s list of restricted cards were banned. In 2004 this officially became Legacy. Sure 13 years might seem like a long time for an offical format, but in the grand scheme of Magic it is not that long ago (Magic’s oldest Modern legal set, 8th edition, was released the summer before Legacy became official). In that time Legacy has become a great format with (until recently) a lot of larger tournament support. I first became involved in Legacy back in the fall of 2011. Although I had been playing since 1993, I had only been playing at FNM & above since 2006. I had a few decks back then in those early FNM days, and one of them was Dredge. I had a lot of fun with the deck (I even used D&D minis as tokens due to those not being official cards in packs until 10th edition), and kept the core of the deck together once it rotated out of Standard. When Innistrad came out I built the version of Solar Flare available then, and reminiscing on the previous version made me long for Dredge. I played a lot at Epic Loot then (and the store was pretty new during that era), and my friend Jason always wanted to play Legacy in between rounds however I lacked a deck…until I told him about the Dredge cards I still had. My spark in Legacy ignited. Dredge is a deck that like to play out of your graveyard, a lot. The Dredge mechanic allows you to replace drawing a card by putting a number of cards from the top of your library into your graveyard equal to the number indicated. Let’s take a look at a Dredge card. Yep. That’s a 6 folks. Here’s one with the keyword, and it’s ruling. So as you can see you won’t be playing a lot of spells from your hand. It really wasn’t until the printing of Faithless Looting that the deck really began to shine. Hey ma, look! No hand! So you may be wondering how we win? Well there are several ways. The current configuration of the deck has changed over the years, but the main purpose of the deck still remains. I’m an innocent 1/1 flyer. 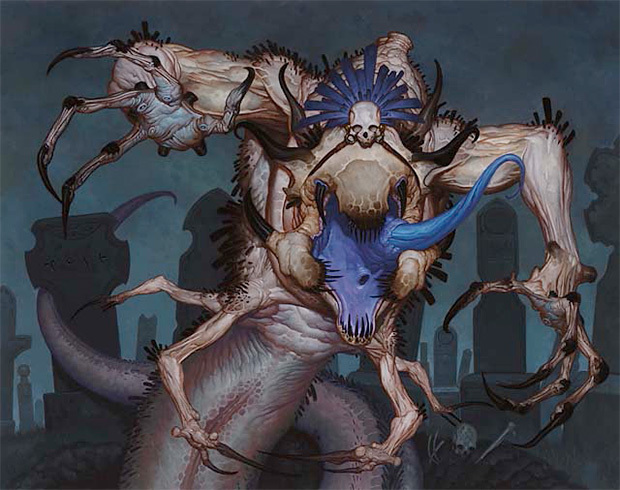 The main way to win is to obtain Nacromoebas by dredging them away, hoping to land several copies of Bridge From Below in your yard, then use Dread Return to sacrifice the Narcomoebas (netting you a lot of zombies), and reanimating Flame-Kin Zealot for an alpha strike. Sometimes though you spend several turns bringing back Ichorid from the graveyard for the low, low cost of exiling another black creature in your yard. With Ichorid’s sacrifice clause it also nets you a lot of zombies on it’s own. The deck capitalizes on these synergies with various cheap draw spells, and ways to put these Dredge cards back into your graveyard. I have thought about other win-cons for the deck, but Flame-Kin Zealot just “gets ’em dead”. This is very important as you want to win game 1 nearly 100% of the time with this archetype. With the rise of BR Reanimator there happens to be a ton of hate for graveyard strategies to contend with once you go to games 2 and 3. Firestorm can be useful when dealing with problem creatures that interupt your graveyard strategy. Be careful not to lose any Bridges in the process. Nature’s Claim works against problem enchantments that prevent us from playing. Elesh Norn, Grand Cenobite is a great target to reanimate causing many of your opponent’s creatures to die. One of the last great color hosers, Iona, Shield of Emeria is nearly an instant win against some strategies, and Ashen Rider is our Show and Tell target. You have to be fast with the deck, and time your plays right. Keep close attention of what cards hit your yard, and what triggers you have available. When using Cabal Therapy do not forget to write down the opponent’s hand so you don’t have to memorize what’s in their hand as well as keep tabs of your own plays. This deck is a lot of fun, and can win you games if you can catch opponent’s unaware. If you know there is a lot of reanimator hate in your meta you may not want to play this, but fortune favors the bold right? I hope you liked the article this time around, and if you have any comments feel free to leave them below. Until next time…TAP MORE MANA! Previous Getting to the Core of the problem.